← English student wins Undergraduate Research Award! Deciding who may speak on college campuses can be fraught with difficult questions. Should colleges provide venues for controversial speakers from outside of their communities, and on what basis? Are the rules for outsiders different from those for university faculty? Should they be? What are the political realities? What are the educational imperatives? What are the legal and constitutional parameters? These are some of the questions explored by approximately 300 people in the University of Wyoming conference center during a symposium arranged by the American Heritage Center in consultation with UW Office of Academic Affairs. 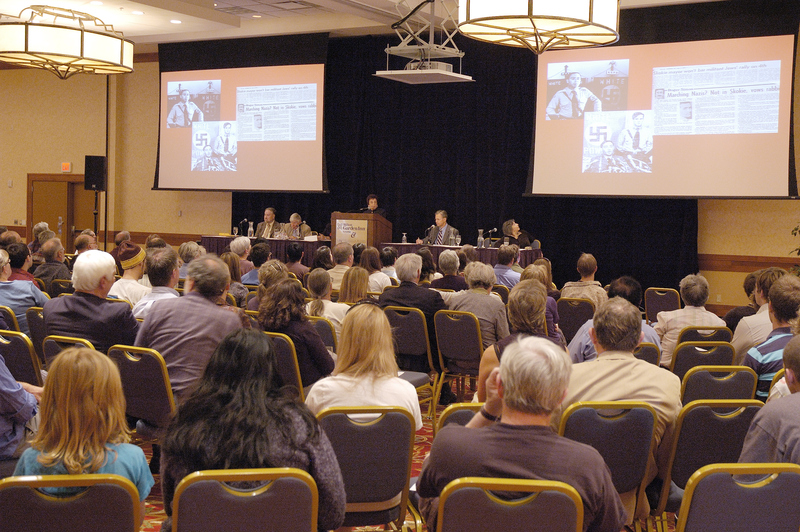 On September 13, 2010, the AHC, the Vice President for Student Affairs, the President, and Academic Affairs brought together four renowned scholars who research and write about free expression in American society to talk to UW and the community about freedom of expression on college campuses. The panelists gathered for the event are nationally regarded as authorities on the First Amendment. Joan DelFattore is a professor of English and legal studies at the University of Delaware and is an award-winning author of books examining free speech issues in the K-12 and college classroom environment. Kenneth Lasson is a University of Baltimore Professor of Law and author of Trembling in the Ivory Tower: Excesses in the Pursuit of Truth and Tenure (2003). Robert O’Neil is the Director of The Thomas Jefferson Center for the Protection of Free Expression in Charlottesville, Virginia. Philippa Strum is a Senior Scholar at the Woodrow Wilson Center for Scholars and author of books examining free speech and civil rights issues. A video of the panel discussion can be viewed here.